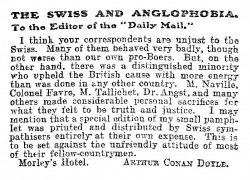 The Swiss and Anglophobia is a letter written by Arthur Conan Doyle published in the Daily Mail on 28 july 1902. I think your correspondents are unjust to the Swiss. Many of them behaved very badly, though not worse than our own pro-Boers. But, on the other hand, there was a distinguished minority who upheld the British cause with more energy than was done in any other country. M. Naville, Colonel Favre, M. Tallichet, Dr. Angst, and many others made considerable personal sacrifices for what they felt to be truth and justice. I may mention that a special edition of my small pamphlet was printed and distributed by Swiss sympathisers entirely at their own expense. This is to be set against the unfriendly attitude of most of their follow-countrymen. This page was last edited on 6 May 2018, at 15:55.